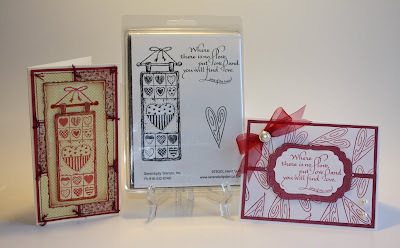 I want to share with you a couple of cards I made using one set of Serendipity Stamps. The set is called Heart Quilt 973QCL and I decided I'd use all of the stamps in the set to make different styles of cards using the set. 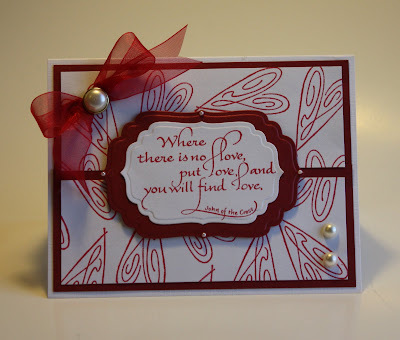 The primitive heart stamp was used as the background paper and the sentiment as the main focal point in the first card. I love making cards in which I have to color and decorate the image but sometimes we are in need of a sentiment card that is elegant and lovely but not with the images to color. 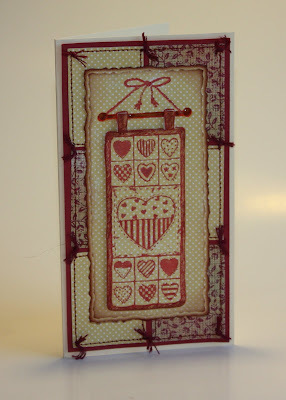 In this second card I used the Heart Quilt stamp and then faux quilted the designer paper background. I stamped the quilt twice and mounted the second quilt on foam tape on top of the first stamped image to give it dimension and the illusion of an actual hanging quilt. We are currently in the midst of a snow storm. It is coming down really hard, fast and furiously so I think today is going to be a stay at home stamping day for me. These are beautiful. It so refreshing to see cards with simple stamping and yet so elegant. Great cards.. It's nice to see that one set being used in such different ways! lovely card and great stamp set!